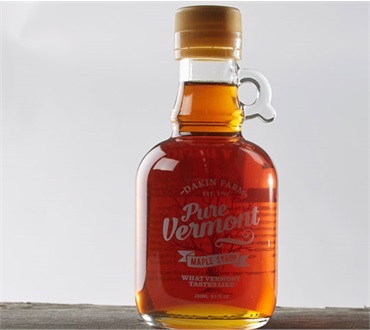 Pure Vermont Maple Syrup is made by sustainably collecting fresh, delicate sap from the Vermont Sugar Maple Trees, then boiling it down to remove excess water. Pure Maple Syrup is a single ingredient, completely natural product with no additives, no preservatives and is naturally Non-GMO, Gluten free and Kosher. Pronounced maple taste and is ideal for those who prefer stronger maple flavors. Dark Robust has a deep amber color and is great for use in recipes, the special flavor of pure maple carries through to your favorite dishes. Compares well to the former Vermont Grade B and former Vermont Grade A Dark Amber. This syrup, item #896, is packed and shipped in our elegant glass jugs that make the perfect gift or a keepsake for yourself. In 2014 Vermont led the world in adopting a new set of international maple syrup grading standards that the International Maple Syrup Institute (IMSI) together with the Vermont maple industry had worked on for over 10 years. This new standard went in to Vermont law in January of 2014 with a one year grace period for the industry to comply. Now, all pure Vermont Maple Syrup which meets the strict quality standards and is packed for the consumer market is labeled as Pure Vermont Grade A Maple Syrup with the addition of a color and flavor descriptor. Under the new standards, no syrup is to be labeled as Grade B, however, those who have traditionally purchased this grade of syrup will be pleased to find that it is still available and is now labeled as Pure Vermont Grade A Maple Syrup Dark Color with Robust Taste. The intent of the new grading system was to define all maple syrup meeting certain quality standards determined to be in the consumer's best interest as Grade A Maple Syrup. Then, a color and flavor descriptor are also applied so the consumer can more easily determine the flavor profile of their preference. In addition to the adoption of the international Grade A definition and the color and flavor descriptors, the Vermont maple industry worked with our department of agriculture to maintain our enviable, premiere position in the international maple syrup market. In doing so, all pure maple syrup which is made in Vermont must also have the word Vermont as part of the grade, and it must meet a higher density requirement than dictated by the international law. When purchasing maple syrup, look for the word Vermont to be part of the grade to be assured you are purchasing the highest quality maple syrup with a flavor and density that is superior to all other maple syrup in the world. All Dakin Farm maple syrup carries our personal guarantee that it is a 100% pure Vermont product and is the finest you will ever taste and best that you can give as a gift.